Joel lives in Congo, a small village surrounded by national park. She specializes in using retro and vintage fabrics like chenille, towelling and wonderfully warm older style blankets. She finds inspiration from vintage fabrics and patterns. All her pieces are one-off works in this way, unique garments, hair clips, earrings, book marks and cushions that no one else will have. Each piece of fabric is so different that she’s continually inspired to create something that people can wear and treasure. She feels that using all recycled fabrics is her part in reducing the heavy load on the environment that our consumer fashion industry drives. 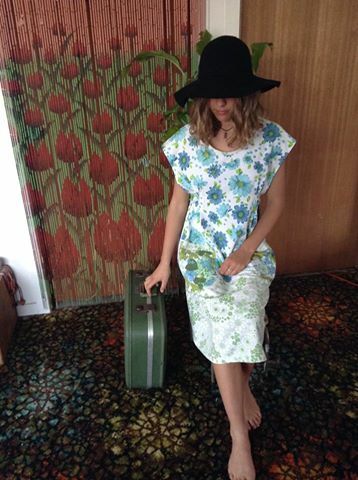 Kitamba, Joel’s label, currently has a new spring range of light cotton dresses from vintage fabrics. They are adorable, flattering and easy to wear, and available in a range of sizes, from size 6 to 20. They have big pockets for goodies and are adjusted by a cute little tie around the back of the dress. Team one up with some Kitamba hair clips or earrings and you’ll be set for spring. This, her latest collection, is highlighted at Artisans Nest Bodalla for this first month of Spring. This entry was posted in News on September 12, 2016 by susangai.